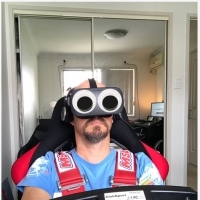 Running Oculus With An Older Rig? Got an older rig I built back in 2012 with a I've upgraded my RAM to 16GB all G.SKill Ripjaws DDR3 and recently picked up a MSI GTX 1060 Armor edition (3GB) for $120 and I currently have an I5 2500 (non k) I have been looking and it seems that I can upgrade to an I7 3770K for less than $200 (Motherboard is EVGA Z68 SLI Micro - LGA 1155 Socket)... is it worth it? would I be able to run VR? it would mainly be for Sim-Racing (Asseto Corsa, Project Cars. etc..) don't need ultra high settings, or would it be better picking up an ultrawide monitor? I used to have a I7 3770K and got a warning it wasn't capable in Oculus home but I had mine OC'd and it worked fine with a 980ti..Just keep in game apps to a minimum... as they smash the CPU. What do you mean by in-game apps?